There is an immense number of customisable details in workstation and cubicle planning, from the height of office partitions and privacy, to hardware and design. 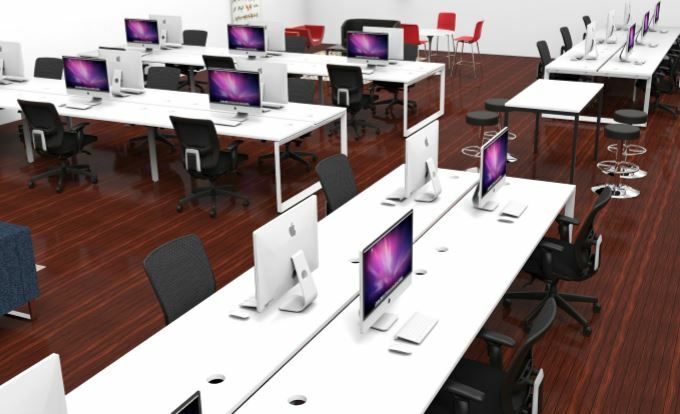 The goal of workstation design is to maximize the use of your space by taking care of the little things like using office partitions of the right size and choosing the desks wisely - whether they be static height or height adjustable. The use of modular office partitions and desking can maximize the use of space while still providing the privacy required in a modern workplace. Time and experise is required to ensure these details are just right. Office Furniture Deals will work with you to define and visualize the workstation that’s best for your space, type of work, and budget. You can choose from our large selection of workstations including office cubicles and ergonomic workstations. Choosing the right office cubicle and workstation aids a healthy work environment. Using ergonomic or height adjustable workstations can help employees maintain a good posture and minimize OH & S risks in the workplace. Office partitions can add an element of flair and practicality while still keeping a budget in mind. Whatever you requirement, Office Furniture Deals is happy to assist, even if it's just to help get some clarity around your big plans.